Hear, O Lord, the supplications your people make under the patronage of the Martyr Saint Blaise, and grant that they may rejoice in peace in this present life, and find help for life eternal. Through our Lord Jesus Christ, your Son, who lives and reigns with you in the unity of the Holy Spirit, one God, for ever and ever. O God, who willed to send the Bishop Saint Ansgar to enlighten many peoples, grant us, through is intercession, that we may always walk in the light of your truth. Through our Lord Jesus Christ, your Son, who lives and reigns with you in the unity of the Holy Spirit, one God, for ever and ever. St. Ansgar became known as the "Apostle of the North" for his great evangelical work in Denmark and Sweden. He was Bishop of Hamburg and then of Bremen. Gregory IV appointed him as his delegate to Denmark and Sweden. It is customary in many places to bless the throats of the faithful with two candles tied together with a red ribbon to form a cross. The rite of the blessing of throats may take place before or after Mass. The priest or deacon places the candles around the throat of whoever seeks the blessing, using the formula: "Through the intercession of St. Blaise, bishop and martyr, may God deliver you free from every disease of the throat, and from every other disease. In the name of the Father and of the Son, + and of the Holy Spirit. R. Amen." Patron: Against wild beasts; animals; builders; carvers; construction workers; coughs; Dalmatia; Dubrovnik; goiters; healthy throats; stonecutters; throat diseases; veterinarians; whooping cough; wool-combers; wool weavers. Symbols: 2 candles; 2 crossed candles; candle; hermit tending wild animals; iron comb; man healing a choking boy; man with two candles; wax; wool comb. Take your children to Mass to receive the blessing of throats today. Establish a home altar with the blessed candles (symbols of Saint Blaise) from the feast of the Presentation, February 2. 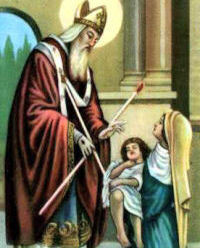 Visit this website and learn more about St. Blaise and how he saved Dubrovnik in Croatia in the 12th century. The "apostle of the north" (Scandinavia) had enough frustrations to become a saint—and he did. He became a Benedictine at Corbie, France, where he had been educated. Three years later, when the king of Denmark became a convert, Ansgar went to that country for three years of missionary work, without noticeable success. Sweden asked for Christian missionaries, and he went there, suffering capture by pirates and other hardships on the way. Less than two years later he was recalled, to become abbot of New Corbie (Corvey) and bishop of Hamburg. The pope made him legate for the Scandinavian missions. Funds for the northern apostolate stopped with Emperor Louis's death. After thirteen years' work in Hamburg, Ansgar saw it burned to the ground by invading Northmen; Sweden and Denmark returned to paganism. Ansgar's biographers remark that he was an extraordinary preacher, a humble and ascetical priest. He was devoted to the poor and the sick, imitating the Lord in washing their feet and waiting on them at table. He died peacefully at Bremen, Germany, without achieving his wish to be a martyr. Sweden became pagan again after his death, and remained so until the coming of missionaries two centuries later. Symbols: Wearing a fur pelise; holding the Catheral of Hamburg.